Clown-a-Round is a clown-like boss in Wario World. He is fought in Wonky Circus. The battle takes place on two platforms, connected by a tightrope. When wanting to cross over to a different side, Clown-a-Round calls for a huge ball with Glue Globes on the side. Wario can't cross the tightrope himself. He must follow Clown-a-Round by grabbing onto a Glue Globe and hitching a ride. Clown-a-Round's apparent "head" is not really his head at all. Clown-a-Round will take off his "head" and fling it and others at Wario. The disembodied heads can still hop around and even float back up to the arena should they get punched off. The heads may charge up and ram Wario. 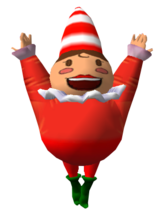 Clown-a-Round usually lets his heads do the attacking; his only other attack is when Wario fails to grab onto a Glue Globe on the giant ball. Clown-a-Round will hurl the ball to the other platform, causing a huge explosion. Fortunately, two small alcoves can offer Wario protection from the attack. To damage him, Wario must wait for Clown-a-Round to begin throwing his heads around. His real face, located underneath where its heads were, will become vulnerable. Wario must attack him and Mega Toss him off the stage. Whenever he loses a health skull, one of the glue globes on his big ball will fall off, making it harder for Wario to hitch a ride. When Clown-a-Round has only two health skulls left, he will lose his hat and reveal what appears to be a candle on his head. When beaten, he gives access to the boss of Spooktastic World, Dual Dragon. Clown-a-Round is the second of two mini-bosses in Spooktastic World, the first being Brawl Doll. Clown-a-Round is the only boss in the game to not be completely destroyed after being defeated, as one of his heads is left behind. If Clown-a-Round is left alone for a while after he removes his "heads", he will bow to the screen and laugh. This page was last edited on October 30, 2018, at 20:28.